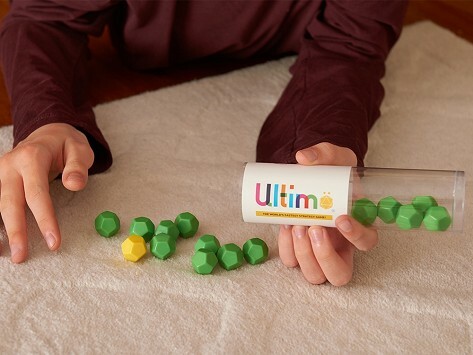 Ultimö dice game is easy to play and addictively fun. The object is to win the gold die—but, not so fast. You can only claim it during the last play of the game. It takes some strategy and planning to stay one step ahead of your opponent as you pick up one, two, or three dice each turn. A match lasts a few minutes and there are lots of ways to play to keep the fun rolling. My 7 year old great nephew figured it out really quickly. Embarrassed me. Great Grand Son 9yrs old loves it! This Game Is a Dodecagon! Ultimö dice board game gets the fast-paced fun rolling while leaning on strategy and probability skills—and on a little bit of luck, too. The object is to get the gold die, but don’t just grab it. You can take up to three dice during each turn, but you can’t take the gold die until the very last play of the game. Sounds simple, but it’s trickier than you might think. There are different ways to play and each match takes only a few minutes—but uses lots of planning and maneuvering to stay one step ahead of your opponent. Maker Vanessa Nobrega and husband Mark Ellingson are a game-loving and game-making couple who are also behind the math game, Mobi. They were inspired by the classic strategy game, Nim, to make this dice-based version. Once you start playing, it’s hard to stop, which we think is the hallmark of any good game.